In the summer, I can’t stand turning on the oven and heating up my house. We love to grill as much as possible and if we can’t, we use the grill pan indoors and enjoy some of favorites. I was recently introduced to Al Fresco Gourmet Sweet & Spicy BBQ Summer Sausage and it was tremendous! I have never tasted a combination so sweet with just the right amount of spice and smokiness to it. I love spicy, just not super hot things, and this was perfect. There are many frozen sausages in the grocery store, but this bold flavor was much better than what I typically buy. I enjoyed changing it up from just a regular pork sausage or patty. 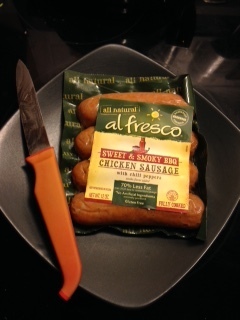 Al Fresco Gourmet products are gluten-free, which is an added bonus for us, and is 70% less fat than other sausages. No guilt involved! I cooked mine up in the grill pan, split it down the middle and put it on a lettuce leaf with grilled up peppers and onions. I then drizzled the whole thing with spicy brown mustard and homemade potato fries. This pregnant lady was in heaven! Try out your favorite toppings on this sausage like BBQ sauce and shredded cheese! 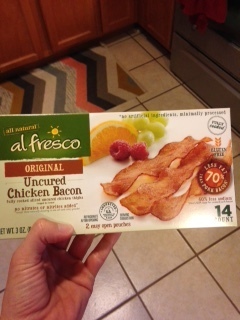 I also tried out their uncured chicken bacon which was, by far, the best flavored uncured bacon I’ve had. Uncured and nitrate-free bacon is hard to find and expensive, but these were reasonable and delicious, plus 70% less fat than regular bacon. I cooked these up with an egg and 1/2 an avocado for my breakfast. I can’t wait to try other Al Fresco products! I highly recommend them if you want flavorful meat options that don’t have all the fat and are healthy for you. Right now, Al Fresco is having a summer sweepstakes! Go to Al Fresco Gourmet Summer Sweepstakes (LINK) and vote for your favorite grilling recipes using sweet and smoky BBQ. When you vote, you will be entered to win $500 AND a grill! Oh! 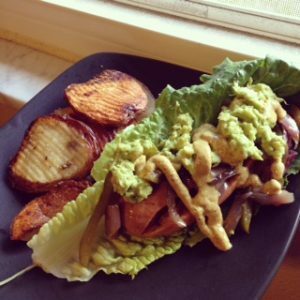 Your bun-less sausage looks like it would be anyone’s dream meal!! 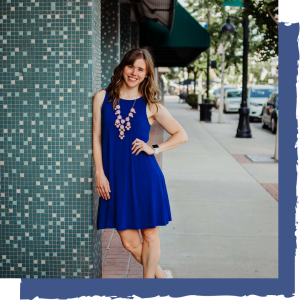 Love al fresco – great contest too!